Here are Mountain Crossings we take pride in our work; in every employee having a vast knowledge of the Appalachian Trail, in fitting boots and trail runners properly, in helping folks have fun and successful thru hike. We are renown for our pack shakedowns and we strive to always serve our customers as well as we can. Still, this is often times overlooked as a reason to come visit Mountain Crossings up against the furry faces of our feline pals, Bronson and Snaggles! It’s true. 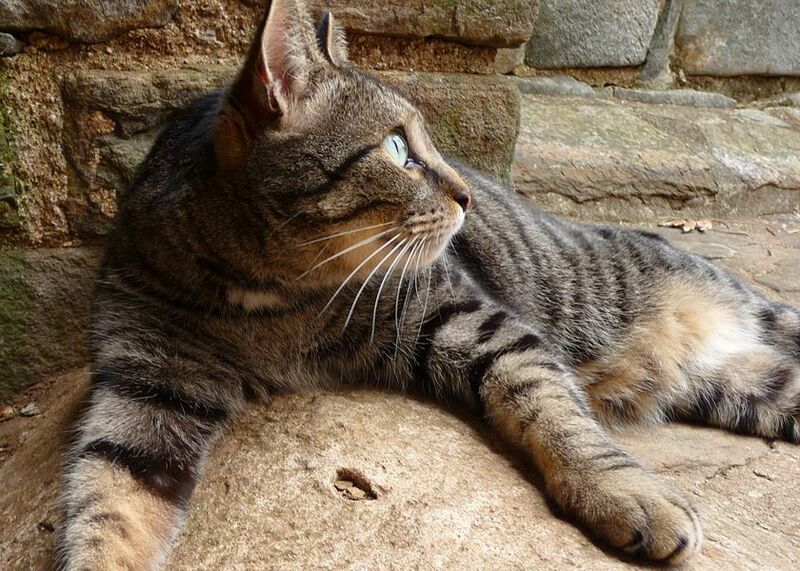 Many people come just for the fresh air and to see the cats. We can’t blame them. They add nicely to the scenery. 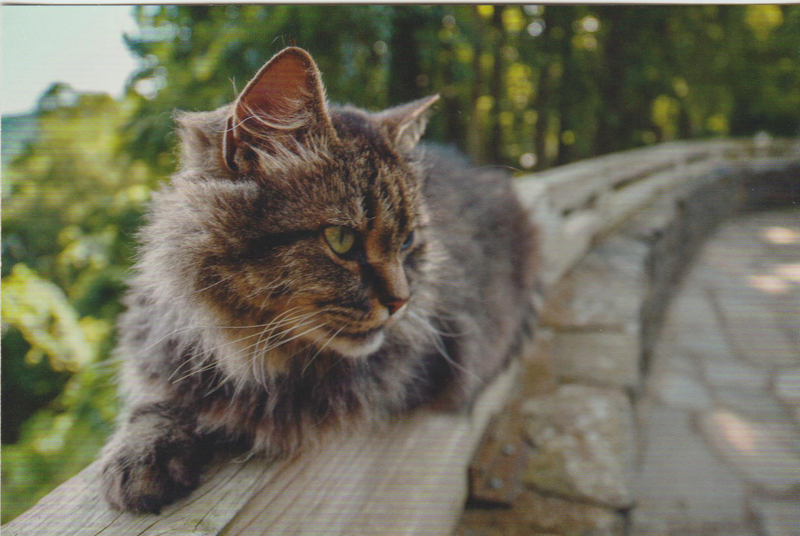 This photograph of Snaggles has been turned into a postcard that is for sale inside the shop! We often hear that our customers bring them snacks and many who don’t will inquire about their eating habits, wondering if they are getting fed well enough. As far as cats must be concerned, I can only imagine that they have got the life. Ample small critters roam the mountain for their hunting fun and feeding and in between they are supplied with dollops of tuna from kind hikers. When they are down on their hunting luck and the flow of visitors is low, these two smart little kitties are excellent at communicating their wants. Bronson will wait at the shop door for you to walk out, then run to his favorite fence post and start showing off his boxing skills. Then he will follow you into the breeze way and leap onto the window sill next to the apartment door and stare into your soul. The look only says one thing, “You’re going to bring out a bowl of Meow Mix, right?” Snaggles is more elusive and not as much of a show off. We know when ever he prances right up to us and begins to show affection that what he wants in return is food. Who could ever deny such cute actions?! Their food bowl may not always be full, but they sure do know how to fill it up again! This image of Bronson was taken by a hiker passing through quite a while ago. We love when folks share photos of our pets with us. Bronson and Snaggles look like a pretty rugged duo because they have had free reign of the mountain for nearly a decade. They were the pets of the former owner, who left them contentedly on the mountain when the business transferred ownership. Snaggles’ long hair picks up leaves and debris wherever he goes. Bronson is a little cleaner looking by genetics and is often cited by customers to be pregnant because of his tubby figure. 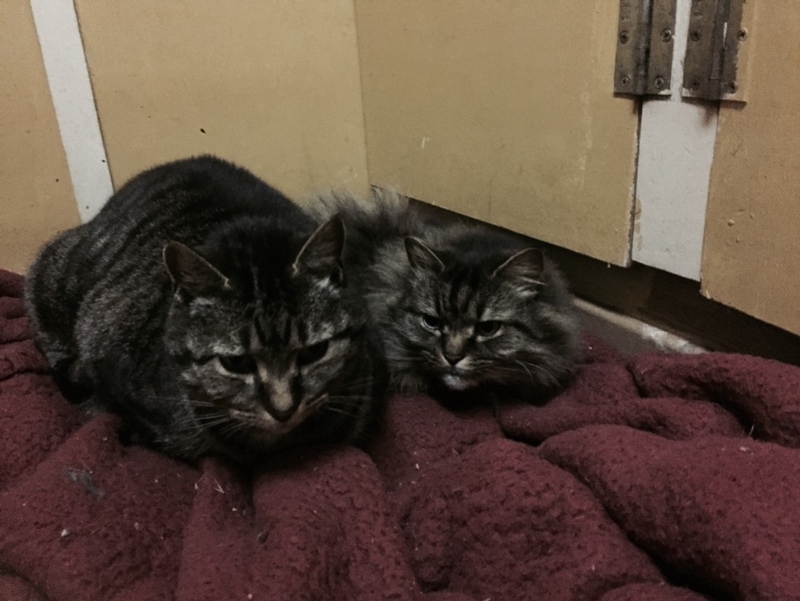 In the winter, these two buddies snuggle up on a bed of blankets in the warm laundry room. It isn’t uncommon to see one or the other lounging about by the heater in winter or soaking up the sun on a picnic table in the warmer months. This entry was tagged appalachian Trail, AT, Bronson, Cats, mountain crossings, Neel Gap, Snaggles. Bookmark the permalink.